As I've been gathering information regarding the Khopesh, I thought it would be handy to start a thread where I can collect everything together, and make it accessible to everyone. Khopesh (ḫpš) is the Egyptian name of the Canaanite "sickle-sword". Its origins can be traced back to third millennium Sumer. The typical khopesh has a blade that exists of a straight unsharpened section, followed by a sickle shaped section which generally has the outer edge sharpened. Early examples are generally tanged, with or without rivets. Later examples had a flanged hilt, with organic inlays. The khopesh was initially used against the Egyptians in war, but as the kingdom of Egypt improved trade relations with other kingdoms, eventually it adopted the khopesh. It seemed to have been most popular during the New Kingdom under the united Egypt. Ramses II was the first pharaoh to have used the khopesh in warfare. The Khopesh became most popular during the New Kingdom (1570–1070 BCE), when it was used as a symbol of royal power. This curved sword bears the cuneiform inscription "Palace of Adad-nirari, king of the universe, son of Arik-den-ili, king of Assyria, son of Enlil-nirari, king of Assyria," indicating that it was the property of the Middle Assyrian king Adad-nirari I (r. 1307–1275 B.C.). The inscription appears in three places on the sword: on both sides of the blade and along its (noncutting) edge. Also on both sides of the blade is an engraving of an antelope reclining on some sort of platform. Curved swords appear frequently in Mesopotamian art as symbols of authority, often in the hands of gods and kings. It is therefore likely that this sword was used by Adad-nirari, not necessarily in battle, but in ceremonies as an emblem of his royal power. This Khopesh is part of the collection of the Metropolitan Museum of Art. Khopesh of Usermaatra Setepenra Meryamun Rameses II (1279-1212BC). This khopesh is part of the collection of the Louvre Museum. This khopesh appears not to have been sharpened, and may have had a symbolic function. Khopesh of Nebkheperura Heqaiunushema Tutankhamen, (1334-1325BCE). Two khopesh examples were found in the tomb of Tutankhamen, preserved in perfect condition, including the wooden hilts (ebony?). Both are located in the museum in Cairo.
. . . This khopesh appears not to have been sharpened . . .
Um, yeah, I'd agree with you there! Seriously, though, thanks for posting these. This is really interesting! First a gorgeous 18th century BC Khopesh found in Shechem, Palestine. The blade is decorated with electrum inlays. The top example here is from a painting from the tomb of Rameses III. It's a straight blade with a curved tip, and therefore isn't a true khopesh. This blade closely resembles examples of ceremonial swords from Scandinavia (ceremonial, as these were unsharpened), such as the second example. The bottom example is a copy of the latter in flint. It is great you have started this thread and I must thank you for having done so much work in finding published pictures. The Kopesh has held some fascination for me as well. I have not been able to handle any originals and those museums I have visited have rarely had an example on display. I did take some notes on the Iranian one in the british museum, that you´ve posted a picture of above. I attach a scan of my notes made by the display in the museum. I just jotted down some estimates of the dimensions. Perhaps they are of help? It should be noted that the Iranian one is completely blunt with a rounded "edge" thickness of about 1-1,5 mm. A bit like a "safe" reenactment edge actually. I got the impression that it could have worked like a one flanged mace. Or possibly, it is a non-finished blade that has not yet had its edge worked down by hammer and stone? As you already have pointed out: it is not unique in lacking a sharp edge. Perhaps they some could have been used as flat bronze maces? I think one should not rule out that they were intended to be used as weapons even if the edge was not shaped down to sharp. Even if blunt, they would have been completely deadly. The scandinavian "kopesh" or "scimitar" is interesting. I have held one of these and got impressions of its heft. To me it very much felt like a sacrificial weapon. It is *not* blunt, but has a useable edge! Perhaps one of those (three?) in existane is indeed blunt? The curled end is rectangular or H-beam in section, and does not have any edge at all. The section behind the swept up end and the grip does have an edge however. My impression is that all three of the existing ones did at one time have functonal edges. I can remeber this wrong, but I did look specifically for this. The one I had opportunity to handle felt and moved much like an axe. Not overly heavy but substantial with a deadly and efficient feel to it. Something to bring down over the neck of a cow or a horse? The impression I got from the thickened swept up end was that it was intended to add extra weight to the outer end of the weapon to increase the power in the chop. Again something that hints at specialized use. It felt much more like something used for slaughter rather than fighting. I do not have a personal tracing or detailed documentation of the scandinavian scimitar at this time, only published material. I´ll try to dig up an archaeological drawing of one of them. Looking forward to more post on this topic! Thanks, Jeroen, for this fascinating thread. I notice on some of the less curly ended version that the tip looks like a might have had a role in thrusting. Is there anything to indicate sharpening at the tip? That said, the blade might be difficult to get out if it went in too far, which sort of leads on to another thought. Since Peter mentions his idea of the scandinavian example being possibly for slaughter as against fighting, might the blunt curled tip have had a secondary role in hooking entrails out of the carcase? Hi Jeroen. This thread is a good idea. Perhaps more word count might be expended smashing the myth that the weapon is related to farming implements. 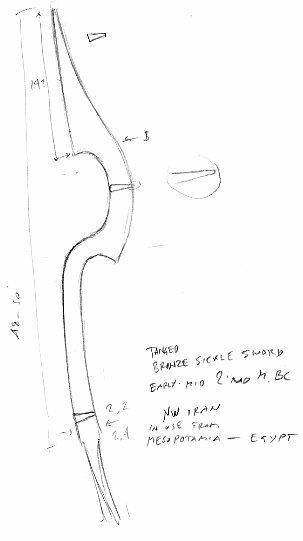 You may also want to mention that the term "epsilon axe" is commonly used in texts to describe the weapon from which the khopesh evolved. Dan, would you be, perchance, referring to the use of the term "sickle-sword" to describe the khepesh? There are not too many replicas out there on the market.... Manning Imperial makes a couple, their Canaanite "Sickle Sword" is actually quite nice, a bit on the heavy side but weildable. Their "Egyptian Khopesh" is a boat anchor. Deepeeka now makes a couple Khopesh-Like-Objects, but they are actually made of steel, not any kind of bronze.... Neil Burridge is our best hope for a nice and fairly accurate Khopesh! Very interesting. The khopesh might have originated from the axe, but the cross-sections of the well-developed versions seem to indicate that they'd be quite hilt-heavy. Any opinions about this? I keep reading that the kopis (machaira) is dexcended from the khopesh. I am not so certain of that, given some of the tip-heavy bronze swords that Peter Connolly has pictured. I was wondering what folks here made of that theory? Or possibly, it is a non-finished blade that has not yet had its edge worked down by hammer and stone? As you already have pointed out: it is not unique in lacking a sharp edge. Perhaps they some could have been used as flat bronze maces? I think one should not rule out that they were intended to be used as weapons even if the edge was not shaped down to sharp. Even if blunt, they would have been completely deadly. Yeah, generally I don't rule out weapons being real weapons. However, these things would be so much more useful if sharpened, and we know they were owned by royalty, so the pure symbolic role is not unthinkable. It could be the equivalent of a king's sceptre. The scandinavian "kopesh" or "scimitar" is interesting. I have held one of these and got impressions of its heft. To me it very much felt like a sacrificial weapon. It is *not* blunt, but has a useable edge! Perhaps one of those (three?) in existane is indeed blunt? The two in the National Museum in Denmark were IIRC blunt. Not blunt as in a rounded edge, but never ground sharp after casting. The curled end is rectangular or H-beam in section, and does not have any edge at all. The section behind the swept up end and the grip does have an edge however. My impression is that all three of the existing ones did at one time have functonal edges. I can remeber this wrong, but I did look specifically for this. It's possible. The odd thing though is that there are no parallels in scandinavia showing a development into these odd things. It definately looks like it appears out of nowhere (or elsewhere, far away). Ah thanks, that was the term I was looking for. I've added it to the first post. I personally think that if the functional ones were similar in balance, they would have handled a lot more like axes, such as medieval broad axes. The only problem is that few if any actual military versions still exist rather then these high status examples, which may not have been functional. So the existing ones may not give a good representation of the functional khopesh.